As the state government has failed to pay the pending DA to two lakh state government employees, the approaching festive season seems to be harsh for them. 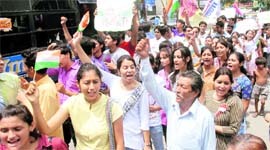 Students and teachers of Green Field School today took out a march in the city to support Anna Hazare’s campaign against corruption. As the DAV PG College Student Council election date is drawing near, the college is witnessing more activities almost every day. Brawls and fights have become the order of the day. One person was killed and three others were injured when a Scorpio carrying them fell into a deep gorge near Batagad on the way to Dhanaulti in Mussoorie around 3.30 pm today. Overflowing garbage bins along the roads all over the city have become an order of the day. It has become a matter of concern for both Dehradun Municipal Corporation (DMC) officials as well as residents of the city. To bring SGGR PG College on the list of those 150 colleges in India which have accredited with the National Assessment and Accreditation Council (NAAC) and to make it a technology-driven educational institution, Principal VA Bourai has a lot to his credit. Ghummakkad Narain, The Travelling Children’s Literature Festival, today saw interactive sessions by eminent literary personalities, Prayag Shukla, Dwijendra Kumar and children story writer Samina Mishra. Samina Mishra, great granddaughter of the former President, Dr Zakir Hussain, is today one of the acclaimed story writers for children who has conducted various workshops across the country encouraging creative writing, thinking and exploration among children. The employees are awaiting payment of January instalment that has already been paid by the Central Government to its employees. Sources claim that the government had no finances that would go towards the payment of the DA and is therefore dithering on the payment. The government would require around Rs 100 crore for paying its two lakh employees. In keeping with the Central Government’s decision, the state government had made a similar announcement saying that instead of cash, it would be crediting the DA to the employees’ GPF account. But six months have passed since the announcement, the employees are yet to receive the amount. The delay has made the employees restive and angry. “We are awaiting the government order, which has not come by as the timely release of the DA could have armed us against price hike,” said an employee. Meanwhile, the Central Government has once again announced the payment of the DA to its employees from July. From July this year, there has been 7 per cent hike in the DA being given by the Central Government. A jump from 51 per cent to 58 per cent. So along with the previous DA instalment, the Uttarakhand Government would now have to make a financial arrangement for paying the latest instalment, which in probability would be along with the salary. The excuse of financial constraints, touted by the government is unable to provide balm to the employees. They are now questioning the alacrity shown by the government in announcing the creation of four new districts when its financial condition is already weak. The march started from Mohini Road at 9:30 am and passed through Sanjay Colony, Balbir Road, Ring Road, Rajiv Nagar and Bhagat Singh Colony to culminate at the school. The tiny tots carrying national flags in their hands raised slogans against corruption. The local residents also joined them in the cause to boost the children. Meanwhile, the People’s Forum, Uttarakhand, continued their fast on the fifth day against corruption. Social activist Kushalpal Singh and others, including Ranjit Singh Verma, Chander Singh and Deenanath Saluja, are on fast. As the DAV PG College Student Council election date is drawing near, the college is witnessing more activities almost every day. Brawls and fights have become the order of the day. Taking a strict note of yesterday’s incident, the police has increased the number of cops in the college and is checking the records of student leaders. The brawl between two student groups yesterday left several injured as the students indulged in stone throwing following which the cops had to use lathis against them. Taking stern action, the cops arrested five of them and will produce them in the local court. The police said no hooliganism or violent activities by the students would be tolerated. “After yesterday’s incident, we have deployed additional force at the college,” SSP Ganesh Singh Martolia told The Tribune. “No procession by the students will be allowed in the city without permission. Even the celebratory procession after the victory of a group will not be allowed to go beyond Survey Chowk,” the SSP pointed out. Martolia also refused to have one way on the DAV College road during the college election canvassing days. “We sometimes make this road one way only during the peak hours and there is no plan to make it one way,” he said. The Student Council elections at the college, which has the largest strength in the whole state, will be held on August 30. Police sources said the four tourists, who were believed to be under the influence of liquor, were on their way to Dhanaulti in Scorpio (HR 56-8333) when their vehicle fell into a deep gorge. Some school students, who saw the vehicle falling into the gorge, informed the police who rushed to the spot immediately. The driver of the vehicle Satpal, resident of Haryana, died on the spot while three others were injured and rushed to the community hospital from where they were referred to Dehradun hospital considering their critical condition. The residents having their houses near garbage bins are the worst affected. None of the garbage bins is found covered properly. The maximum garbage lies on the road instead of the bin and, moreover, corporation officials don’t clean dustbins. The problem is cropping up in areas, including the area near DAV College Road, EC Road, near Drona International School, in Defence Colony, DL Road, Mohini Road, Balbir Road, Inder Road etc. 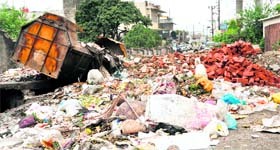 Though the corporation has now given the responsibility to STML, a Delhi-based firm, to collect garbage from houses and also to pick it from dustbins, yet, according to the councillors, the firm never picks that. 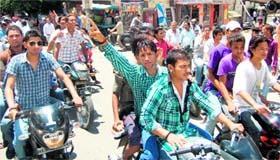 Ashok Verma, Leader of the Opposition, DMC, said they were afraid that the company would be able to continue the work. “It is the company’s job to pick up the garbage near dustbins and clean the area but it never does so. I doubt the company could run away in the near future. People here also lack the civic sense and throw the garbage outside the bins,” he stated. Verma further added that rag pickers and stray animals also littered the garbage from bins and contributed to adding to the waste pollution. Councillor Rajkumar said residents were still unaware about the door-to-door garbage collection process and this was the reason they threw the garbage in the dustbin. “The company has not given any proper information to people regarding the services. They said they would be distributing pamphlets but never did so. Had the people come to know about the same, they would not have thrown the garbage out of their house,” he mentioned. Councillor Rama Gaud told The Tribune that the corporation was silent on the cleanliness in the city. Dr Kailash Joshi, Senior Health Officer, DMC, affirmed that they were trying to maintain sanitation in the city and the company that had been given the contract was doing the work properly. He further said they required the support of public to keep the city clean, as it was difficult to maintain otherwise. “I joined the college in 2006 as the Principal and brought the college to this level with lots of hard work. We got it accredited with the NAAC-UGC this year and this has made it one of the 150 UGC-accredited colleges of the country,” Bourai told The Tribune in an exclusive interview. Bourai, who started his career as a lecture from the same college in 1983, believes in imparting modern technologies through studies. “We should adopt modern technologies as it will develop the overall personality of the students,” he said. “Ours is the only college in Doon which has got wi-fi accessibility, an e-library, a well-structured women’s study centre and a college website for the convenience of our students. When I joined the college, there was not even a single computer in the college and today every faculty has a computer. This is a very important step towards adopting modern technology in education,” the principal added. However, the principal also boasts of raising a decent infrastructure in the institute and managing to create mini India on the campus as students from all over India are thronging to SGRR PG College, Dehradun, to acquire quality education. Bourai, is an eminent educationist in Uttarakhand who has done his basic education and graduation from Rajasthan. He recalls to be medically unfit to further pursue his training at the Indian Military Academy, which was his first preference for career. “My father was a Vice-Chancellor at University of Rajasthan, while my grandfather and great grandfather were principals in Garhwal,” he quipped. Bourai has completed his masters and M Phil in economics. He has also done his research at University of Calgary, Canada, North West University, the United Kingdom, and Kathmandu University, Nepal. His more than 30 A grade journals have been published in India and abroad, previously. In the first session of the day at Jaswant Modern School, Prayag Shukla read out some of his poems based on themes of children. He even asked children to read some excerpts from books of their choice. “You must take to reading and ensure that it becomes part of your habit,” he said. Dwijendra Kumar, Assistant Editor, National Book Trust, also interacted with children. He asked children about their reading experience and advised them to take to reading as per their inclination. “You can read any book of your choice whether comic or others,” he said. Children story writer Samina Mishra also interacted with children and asked them about their reading choices. Shaguna Gahilote, Project Officer (UNESCO) said UNESCO’s “donate-a-book” initiative held much relevance in the wake of the Right to Education Act and emphasised on the setting up of libraries having all types of books, magazines and storybooks. This initiative, she said, aimed at promoting reading among children through a series of activities. Meenakshi Gandotra, Principal of Jaswant Modern School, and schoolchildren were also present. The festival is held in the memory of Doonite Thakur Vishva Narain Singh, a noted journalist and writer. After studying history at St Stephen’s College, Delhi University, and mass communications at Jamia Millia Islamia, New Delhi, her talent as a writer was recognised when her first book for children, “Hina in the Old City”, was published by Tulika. She was here today to attend the UNESCO Travelling Literature Festival being held in the memory of eminent journalist and writer Thakur Vishva Narain Singh. Talking to The Tribune, Samina said children should have reading habits so that it could help them in the future. “Parents and teachers must ensure that children should develop the habit of reading at an early age. There should be small community libraries for children. As good books are expensive, parents can arrange funds and set up small community libraries,” Samina emphasised. She said the Internet could also help children in many ways. It can help them have an access to good books that were costly. She further said children should never be forced into reading only academic books. They should be encouraged to read other books related to the nature or the environment. She said non-fiction books could be made a part of their studies. 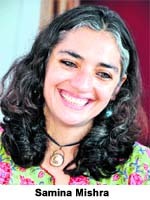 Samina is at present engaged in conducting workshops for poor children of Delhi.